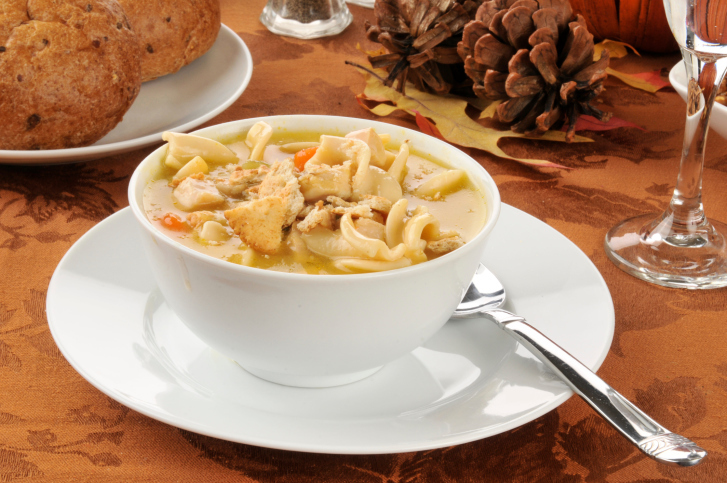 Unless you’ve frozen your Thanksgiving turkey carcass, it’s too late to make this soup now. But if you make a turkey for Christmas, or just for any old reason, this soup will be one of the best things to come from it. This soup has a special place in my family’s heart. It’s the soup my mother-in-law Rita makes (still, at age 89!) whenever we come to visit. If it’s not ready when we get in late at night, it’s surely served for lunch the next day, even if we try to make things easy for her by getting pizza or something. But there are certain things that must be done to make it Rita’s: There must be RING noodles. There must be cut-up carrots. And it must be accompanied by a sprinkling of Romano cheese. If Lou’s sister Liz is around, there will be no peas because Liz (at age 50-plus) does not eat cooked peas. But otherwise, we all love peas in it. If your turkey makes more broth than you want for soup, put the extra broth in a glass jar (leaving and inch or two space for it to expand) and put it in the freezer for later. Don’t forget to label it! I am not giving measurements here because it depends on both the size of your turkey and your preferences…it’s hard to go wrong here. 1. Stuff the turkey carcass into a giant soup pot and cover with water. 4. Strain the bits from the broth. At this point, freeze what you are not going to use right away, and leave the rest in a smaller pot on the stove. 5. In a separate pot, boil the ring noodles until done. 6. Cut up carrots and add to the broth. Add peas, if using. Bring broth to a boil. Let people add their own grated Romano cheese at the table (and more salt and pepper, too). Yum. Tastes like love to me. Must be yummy! especially if grandma makes it..
Every Holiday, I use what is left of the Turkey to make a wonderful soup broth. If you don’t have several hours to make the broth from scratch, you can add a bit of store broth to juice up the flavor along with the bones boiling. Also, don’t forget to run all of the stock through a strainer to remove the bone fragments. I add parsnips and celery to my soup. The parsnips add a sweetness that makes people take notice.